Leaving Koh Phangan was a tragedy in itself. It was mildly depressing, to say the least, and what came next certainly didn’t make things any better. After a 6 day bender followed by no sleep, I was hungover, tired and ready to be tucked away in a bed somewhere. But no, that would not be the case for me. To start the lovely adventure, our ferry to leave the island was about an hour late, so we had to sit in the hot sun for an extra 60 minutes. When the ferry finally did arrive, we were relieved. Little did we know, things were about to get a whole lot worse. I stole this pic from Google, but this is what the boat looked like. Yes, the seats were as hard as they look. We boarded the ferry around 1:30 PM and went to the bottom cabin to fall asleep. The boat was packed. We were seated body-to-body in the direct sunlight…with no air conditioning. After a few hours of hot, sticky tossing and turning and moving my head side-to-side so as to avoid neck cramps, I was suddenly woken up by a thick smell. Exhaust. I think. I tried to ignore it, but the smell got stronger. It got to the point where I was coughing, choking on the dense air, about to throw up. I used my sweater as an air filter over my mouth and nose to breathe through. It yielded little success. Shallow breaths, Skye. The ferry had stopped and people were exiting. In a state of half-asleep daze and confusion, I started to panic. Is there a fire? Did the boat breakdown? 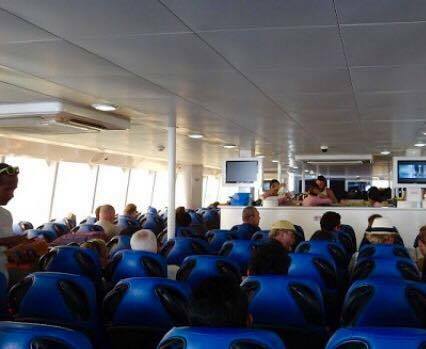 Are people evacuating the boat? And why is everyone so calm during this emergency?? Our ferry arrived in Surat Thani, Thailand at 7:30 PM, where we then took a sleeper bus to Bangkok. I mostly read on the bus ride, so I was the only one awake when we arrived to Bangkok at 2:30 AM. The four of us (Bri, Kaitlin, Nate and myself) knew we were going to Siem Reap, Cambodia next, but we hadn’t booked any transportation to get there. So here we were, half asleep, stranded on the streets in Bangkok at 2:30 AM. The video below is an example of what a typical sleeper bus looks like. After some cranky arguing, we finally agreed on taking a taxi to the airport. We used airport WiFi to find a flight from Bangkok to Siem Reap. We booked the 8 AM flight for more money than we should have. Flash forward, we’re in Siem Reap now. 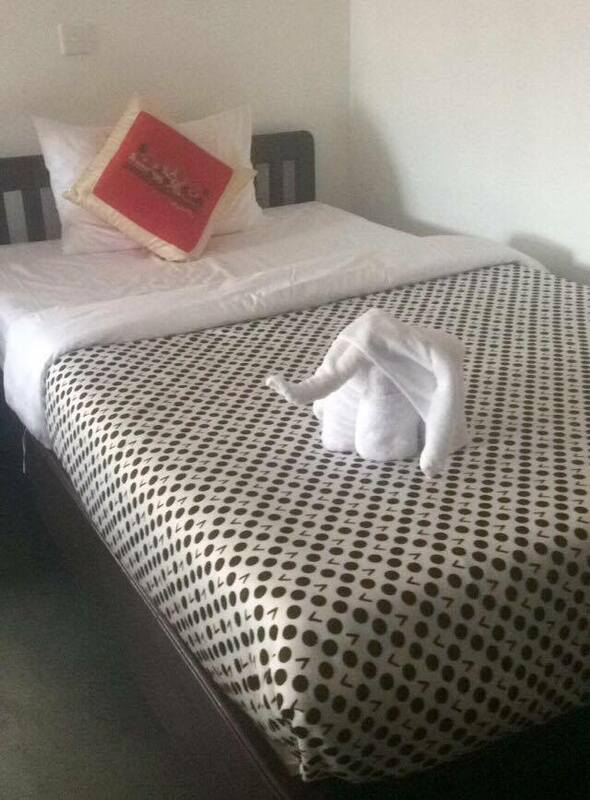 My bed at Angkor Breeze Villa – YES PLEASE! At the Siem Reap airport, we went through customs, bought our $32 visas and got the first taxi to Angkor Breeze Villa – our home for the next couple of days. We decided on a hotel instead of a hostel this time because everyone was exhausted from Koh Phangan. Not to mention, Bri, Kaitlin and Nate had all caught a cold by this point. Awesome. Being the only one not sick, I figured it was only a matter of time before I caught whatever they had. *spoiler alert* I loaded up on electrolytes and never ended up getting sick. Yay immune system! Go you! We spent most of the afternoon lounging at the hotel, listening to the pouring rain. Oh, and something I forgot to mention in my previous posts, I was convinced I had contracted bed bugs or some sort of mites at the bungalow back in Koh Tao, so I took this time to carefully analyze each piece of clothing I owned on the balcony. Kaitlin and I started talking about wanting to get a pizza delivered since it was raining. We scoured the internet and were slapped in the face with the realization that “pizza delivery” is not a thing here. Oh, the simple luxuries we miss from home. When the rain let up, we put on sandals and went splashing through the streets to find food. Our GPS led us in circles while trying to find The Pizza Company – we were set on the idea of pizza at this point – and everyone was frustrated. Kaitlin and I couldn’t wait any longer. We needed a snack. We stopped at the next food stand we saw and each ordered a mystery pastry. Bad idea. We should have known better when we saw the lady put them in the microwave. The pastries ended up in that half hot/half cold state which is always weird. Mine had some sort of meat in it. Eventually we made it to The Pizza Company, ate some much needed pizza and went home for the first peaceful sleep we’d had in weeks. The sleeper buses look so comfy! Is it basically like a hotel on wheels?